An international team, including three astronomers from the European Southern Observatory (ESO), has used the technique of gravitational microlensing to measure how common planets are in the Milky Way. After a six-year search that surveyed millions of stars, the team concludes that planets around stars are the rule rather than the exception. The results will appear in the journal Nature on 12 January 2012. Over the past 16 years, astronomers have detected more than 700 confirmed exoplanets  and have started to probe the spectra (eso1002) and atmospheres (eso1047) of these worlds. While studying the properties of individual exoplanets is undeniably valuable, a much more basic question remains: how commonplace are planets in the Milky Way? Most currently known exoplanets were found either by detecting the effect of the gravitational pull of the planet on its host star or by catching the planet as it passes in front of its star and slightly dims it. Both of these techniques are much more sensitive to planets that are either massive or close to their stars, or both, and many planets will be missed. An international team of astronomers has searched for exoplanets using a totally different method — gravitational microlensing — that can detect planets over a wide range of mass and those that lie much further from their stars. Arnaud Cassan (Institut dʼAstrophysique de Paris), lead author of the Nature paper, explains: "We have searched for evidence for exoplanets in six years of microlensing observations. Remarkably, these data show that planets are more common than stars in our galaxy. We also found that lighter planets, such as super-Earths or cool Neptunes, must be more common than heavier ones." The astronomers used observations, supplied by the PLANET  and OGLE  teams, in which exoplanets are detected by the way that the gravitational field of their host stars, combined with that of possible planets, acts like a lens, magnifying the light of a background star. If the star that acts as a lens has a planet in orbit around it, the planet can make a detectable contribution to the brightening effect on the background star. Microlensing is a very powerful tool, with the potential to detect exoplanets that could never be found any other way. But a very rare chance alignment of a background and lensing star is required for a microlensing event to be seen at all. And, to spot a planet during an event, an additional chance alignment of the planet’s orbit is also needed. Although for these reasons finding a planet by microlensing is far from an easy task, in the six year's worth of microlensing data used in the analysis, three exoplanets were actually detected in the PLANET and OGLE searches: a super-Earth , and planets with masses comparable to Neptune and Jupiter. By microlensing standards, this is an impressive haul. In detecting three planets, either the astronomers were incredibly lucky and had hit the jackpot despite huge odds against them, or planets are so abundant in the Milky Way that it was almost inevitable . The astronomers then combined information about the three positive exoplanet detections with seven additional detections from earlier work, as well as the huge numbers of non-detections in the six year's worth of data — non-detections are just as important for the statistical analysis and are much more numerous. The conclusion was that one in six of the stars studied hosts a planet of similar mass to Jupiter, half have Neptune-mass planets and two thirds have super-Earths. The survey was sensitive to planets between 75 million kilometres and 1.5 billion kilometres from their stars (in the Solar System this range would include all the planets from Venus to Saturn) and with masses ranging from five times the Earth up to ten times Jupiter. Combining the results suggests strongly that the average number of planets around a star is greater than one. They are the rule rather than the exception. “We used to think that the Earth might be unique in our galaxy. 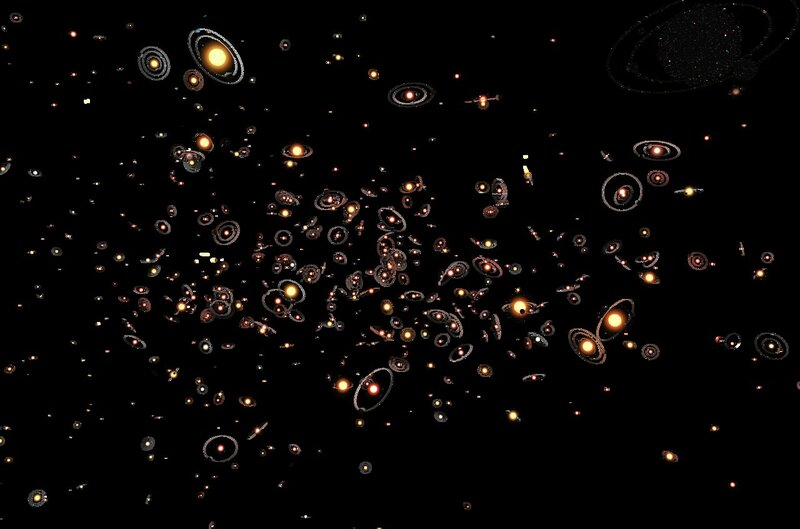 But now it seems that there are literally billions of planets with masses similar to Earth orbiting stars in the Milky Way,” concludes Daniel Kubas, co-lead author of the paper. The Kepler mission is discovering huge numbers of “candidate exoplanets” that are not included in this number. Probing Lensing Anomalies NETwork. More than half of the data from the PLANET survey used in this study come from the Danish 1.54-metre telescope at ESO's La Silla Observatory. A super-Earth has a mass between two and ten times that of the Earth. So far 12 microlensing planets have been published in total, using various observational strategies. The astronomers surveyed millions of stars looking for microlensing events. Only 3247 such events in 2002-2007 were spotted as the precise alignment needed is very unlikely. Statistical results were inferred from detections and non-detections on a representative subset of 440 light curves. This research was presented in a paper, “One or more bound planets per Milky Way star from microlensing observations”, by A. Cassan et al., to appear in the 12 January issue of the journal Nature. The team is composed of A. Cassan (Institut dʼAstrophysique de Paris, France [IAP]; ESO), D. Kubas (IAP), J.-P. Beaulieu (IAP), M. Dominik (University of St Andrews, United Kingdom), K. Horne (University of St Andrews), J. Greenhill (University of Tasmania, Australia), J. Wambsganss (Heidelberg University, Germany), J. Menzies (South African Astronomical Observatory), A. Williams (Perth Observatory, Australia), U. G. Jørgensen (Niels Bohr Institute, Copenhagen, Denmark), A. Udalski (Warsaw University Observatory, Poland), M. D. Albrow (University of Canterbury, New Zealand), D. P. Bennett (University of Notre Dame, Notre Dame, USA), V. Batista (IAP), S. Brillant (ESO), J. A. R. Caldwell (McDonald Observatory, Fort Davis, USA), A. Cole (University of Tasmania), Ch. Coutures (IAP), K. Cook (Lawrence Livermore National Laboratory, USA), S. Dieters (University of Tasmania), D. Dominis Prester (University of Rijeka, Croatia), J. Donatowicz (Technical University of Vienna, Austria), P. Fouqué (Université de Toulouse, France), K. Hill (University of Tasmania), N. Kains (ESO), S. Kane (NASA Exoplanet Science Institute, Caltech, USA), J.-B. Marquette (IAP), K. R. Pollard (University of Canterbury, New Zealand), K. C. Sahu (STScI, Baltimore, USA), C. Vinter (Niels Bohr Institute), D. Warren (University of Tasmania), B. Watson (University of Tasmania), M. Zub (Heidelberg University), T. Sumi (Nagoya University, Japan), M. K. Szymański (Warsaw University Observatory), M. Kubiak (Warsaw University Observatory), R. Poleski (Warsaw University Observatory), I. Soszynski (Warsaw University Observatory), K. Ulaczyk (Warsaw University Observatory), G. Pietrzyński (Warsaw University Observatory), Ł. Wyrzykowski (Warsaw University Observatory). The year 2012 marks the 50th anniversary of the founding of the European Southern Observatory (ESO). ESO is the foremost intergovernmental astronomy organisation in Europe and the world’s most productive astronomical observatory. It is supported by 15 countries: Austria, Belgium, Brazil, the Czech Republic, Denmark, France, Finland, Germany, Italy, the Netherlands, Portugal, Spain, Sweden, Switzerland and the United Kingdom. ESO carries out an ambitious programme focused on the design, construction and operation of powerful ground-based observing facilities enabling astronomers to make important scientific discoveries. ESO also plays a leading role in promoting and organising cooperation in astronomical research. ESO operates three unique world-class observing sites in Chile: La Silla, Paranal and Chajnantor. At Paranal, ESO operates the Very Large Telescope, the world’s most advanced visible-light astronomical observatory and two survey telescopes. VISTA works in the infrared and is the world’s largest survey telescope and the VLT Survey Telescope is the largest telescope designed to exclusively survey the skies in visible light. ESO is the European partner of a revolutionary astronomical telescope ALMA, the largest astronomical project in existence. ESO is currently planning a 40-metre-class European Extremely Large optical/near-infrared Telescope, the E-ELT, which will become “the world’s biggest eye on the sky”.